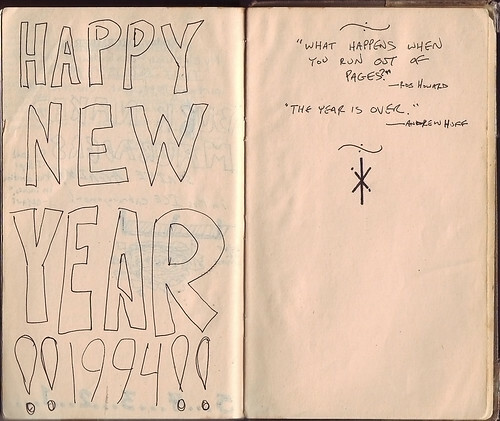 In 1993, I spent the year writing in a blank datebook from 1954. Now, in 2010, I'm posting each page on the web and writing about it. You may want to start at the beginning. "What happens when you run out of pages?" And here we are in 1994, out of pages. In the following year, my college experience both improved and got worse. Melissa and I broke up, slowly and painfully because I really didn't want to do it, even though it was for the best (clearly). Before it was finally final, though, I started dating a woman named Murray (it was a family name) who had also recently ended a long-distance relationship, and we had a mildly dysfunctional thing of our own for almost a year. A couple years later, I might have had a chance to get back with Melissa, but I really hadn't dealt with my depression and other emotional issues surrounding our breakup, and I handled it poorly. To be clear, I don't have regrets about that. Had I stayed with Melissa or gotten back together with her, there's no telling whether we would have lasted. And either way, if that had happened, I never would have found Cinnamon, whom I can't imagine being without. I also got involved in the school newspaper and helped launch an independent monthly called "The Response." Those experiences led me down the path of starting a blog in 2001, starting Gapers Block in 2003, and countless other projects since then. Would any of that have happened if things had gone differently? Possibly. Possibly not. What happened next with 1954? Well, the site is staying up, obviously. My plan is to go back in on occasion and add additional thoughts and memories as they come to me. This has been a really interesting exercise, and one I'm glad I undertook. If you have an old journal like this, I recommend going through and revisiting it in a similar manner. Find recent content on the main index or look in the archives to find all content. Learn more about the project here.